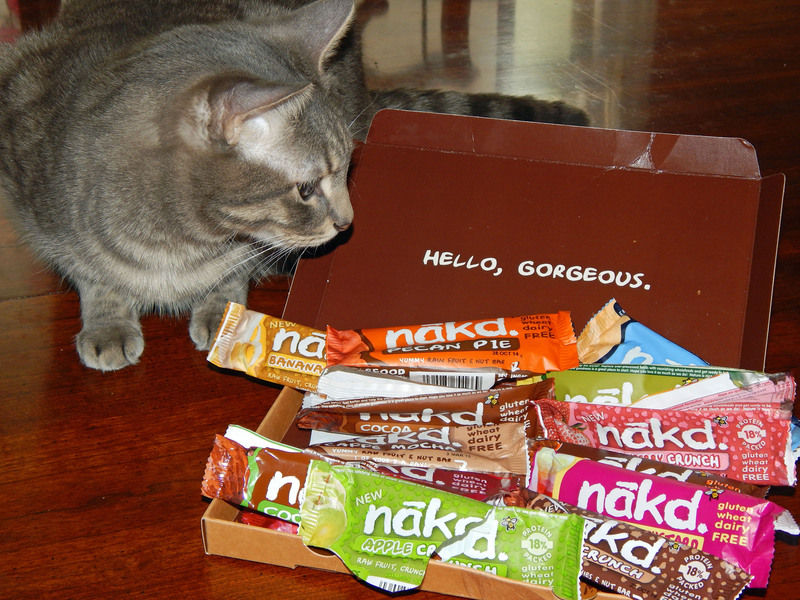 Home › Product Reviews › Vegans In America Can Finally Get Nakd! Vegans In America Can Finally Get Nakd! I was intrigued when I was contacted about doing a review in return for a free mixed box of Nakd Bars – a brand of raw fruit and nut bars that are popular in England and are now crossing the Atlantic. Yes, you can now get Nakd in America! Nakd Bars are gluten free. Nakd Bars have no added sugar. Nakd Bars are low sodium. Most flavors of Nakd Bars contain so much dried fruit, the bar actually counts as one of your “five a day”! Most flavors of Nakd Bars clock in at under 150 calories, with the Crunch ones having less than 110. 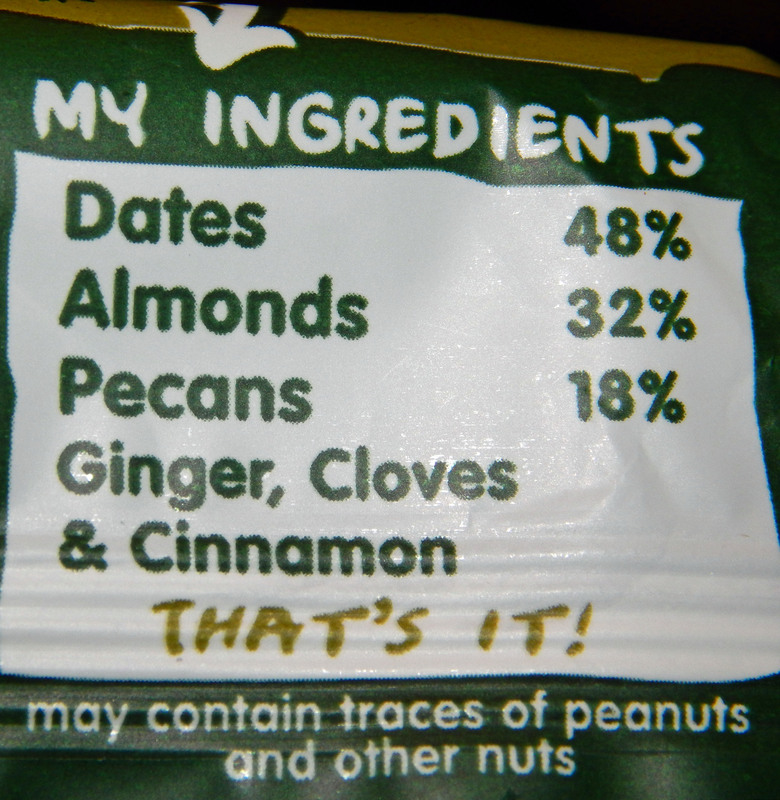 The ingredient lists for Nakd Bars is refreshingly simple. A list of four to six recognizable ingredients – such as Dates, Cashews, Raisin, Cocoa – and the percentages of each. I’ll be honest, I have not been a big fan of snack bars/energy bars/protein bars in the past. I’ve virtuously bought a few and stashed them in my desk drawer at work for a “healthy” mid-morning snack. Midmorning comes, I unwrap one of those sweet and salty little candy bars masquerading as health food – and before I know it, I’ve eaten three of the tiny things! Worse, it’s still two hours from lunch, I’m still hungry, and now my blood sugar has started to jitter around. Cocoa Orange Nakd Bar. These bars are uniquely satisfying. 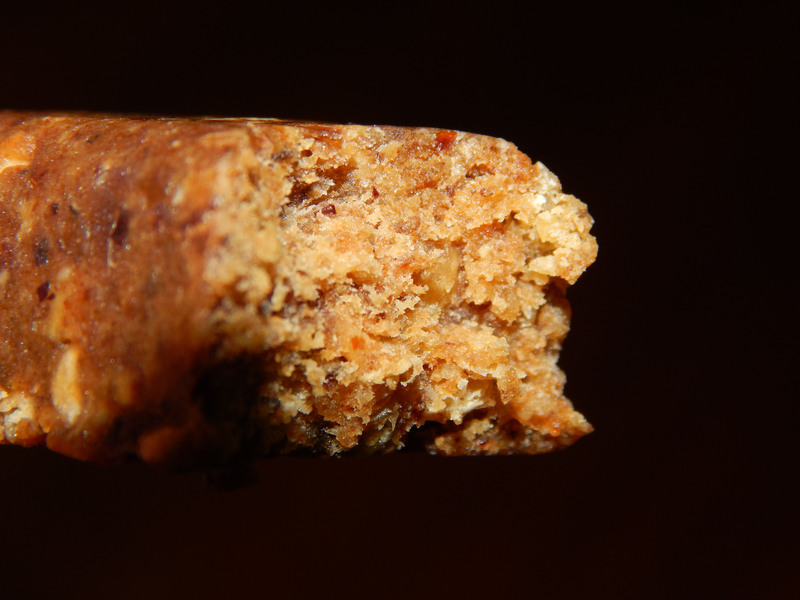 Which brings me to the number one most amazing thing about Nakd Bars – they are incredibly satisfying. They are roughly the same size as other bars out there but very dense. 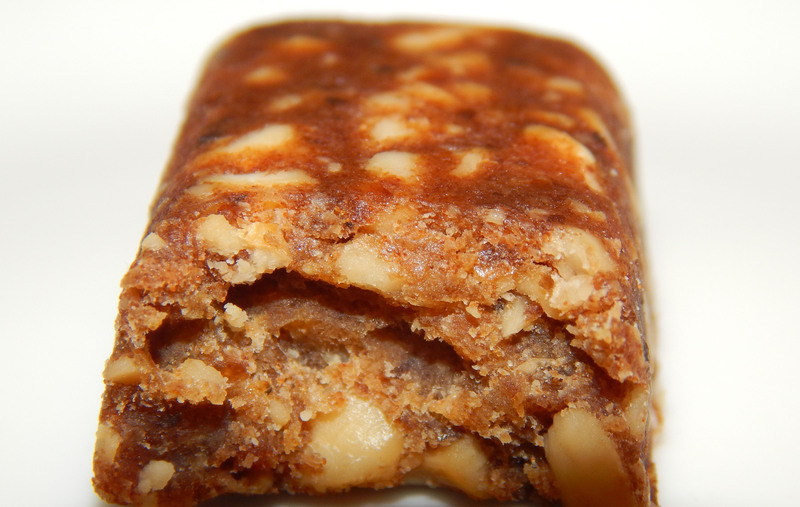 Most Nakd bars have a high nut content – one of my favorites, Ginger Bread, is 50% nuts (32% Almonds and 18% Pecans). That provides some healthy fats as well as protein. Nakd Crunch varieties have soya crunchies to boost the protein content even more. And, of course, they don’t have the high sodium/added sugar trigger. I found I could easily eat a Nakd bar, savor it slowly, and feel completely satiated, able to go a few more hours without hunger pangs or blood sugar swings. Now let’s move on to the important thing – taste. Because it doesn’t matter how healthy something is if you don’t enjoy eating it! Shall we start with the chocolate flavors? Nakd Bars has five chocolate flavors – Cocoa Orange, Cocoa Delight, Cocoa Crunch, Cocoa Mint, and Caffe Mocha. These bars should delight most chocolate lovers. 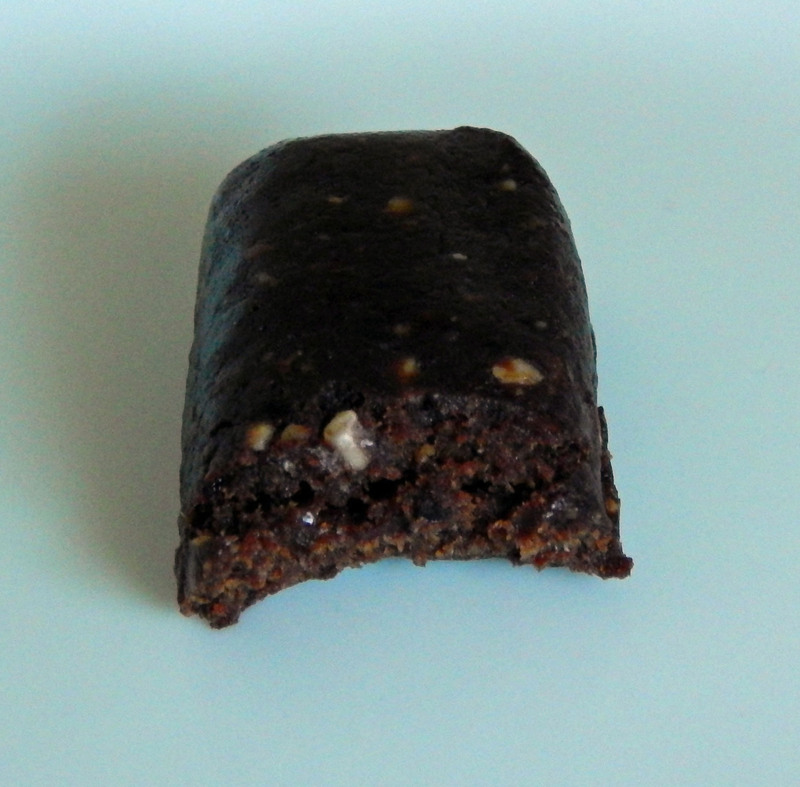 As I’ve previously noted, the texture of Nakd Bars is very dense and eating the chocolate varieties is like eating a very dense, fudgie brownie. I should also note I did not find these bars to be quite as sweet as other chocolate “health” bars, but I found that to be a good thing. My favorites in this category were the Cocoa Crunch and the Caffe Mocha – which was indistinguishable from a dark chocolate espresso brownie. Seriously. Last few bites of a Nakd Caffe Mocha bar. All of the Chocolate varieties go very well with a cup of coffee or a glass of soy or almond milk. The Berry Bars – Berry Delight (raspberries) and Strawberry Crunch (strawberries, duh!) Both have a strong berry flavor and seemed to be a little sweeter than some of the other bars. Apple Crunch – One of my favorites! Dates, soya crunchies, cashews, raisins, apples, and apple juice concentrate. Tastes like apple pie. 108 calories and 5.5 grams of protein. Banana Crunch – To my surprise, I liked this. I say “to my surprise” because I don’t care very much for bananas – although I do like dried banana slices sometimes. Banana fans should love it. Cashew Cookie – Tastes like – what else? – a cashew cookie. Ginger Bread – I really, really liked this one. Almonds, pecans, and dates with cinnamon, cloves, and fresh-tasting ginger. Excellent with a cup of hot tea. Pecan Pie – This is the only bar that Nakd needs to do a little more work on. It tastes nothing at all like pecan pie (unless pecan pies taste mighty different in the U.K. than they do in the U.S.) If I were to guess a flavor, I would pick prune. 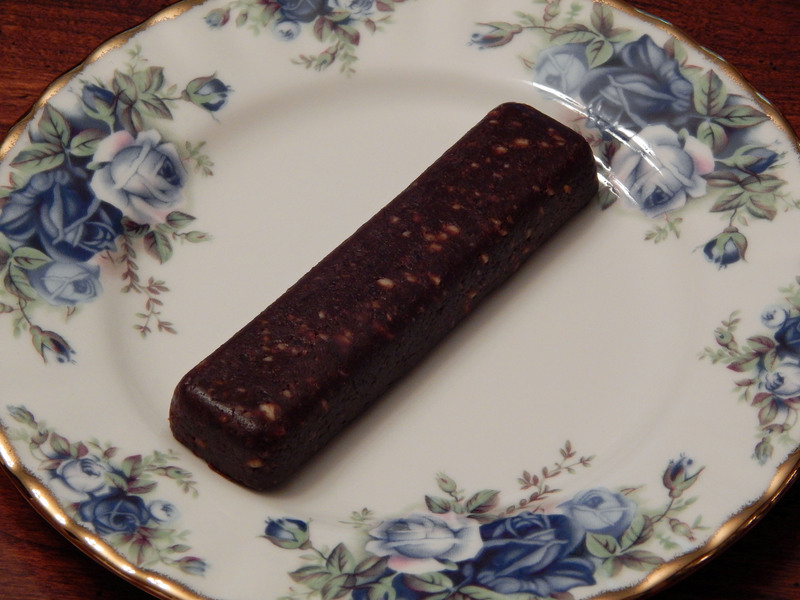 I’m sure there are a lot of seniors out there that would love a prune bar but in the future this is one Nakd bar I’ll pass on. Rhubarb and Custard – Sorry, I can’t judge this one, as I’ve never had rhubarb! 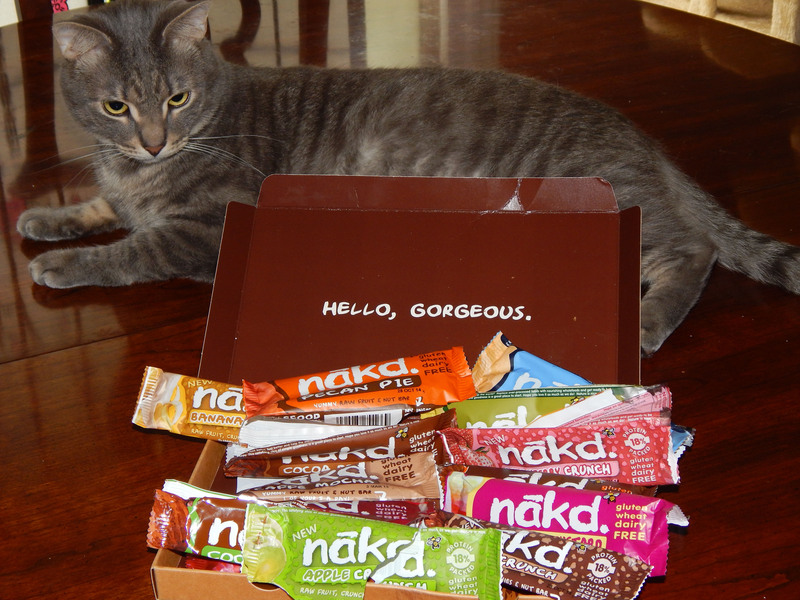 So, where can you get Nakd? Although you can get Nakd in the Co-Operative and Sainsbury in England, you can’t get Nakd in American grocery stores – yet. But you CAN get Nakd in the comfort of your own home! Natural Balance will ship these fruit and nut bars directly to you! I’d consider trying one of the Mixed Boxes to discover your favorite. While you’re at it, also take a few moments to browse about the Natural Balance website – especially the Community page, which has some interesting articles and videos. 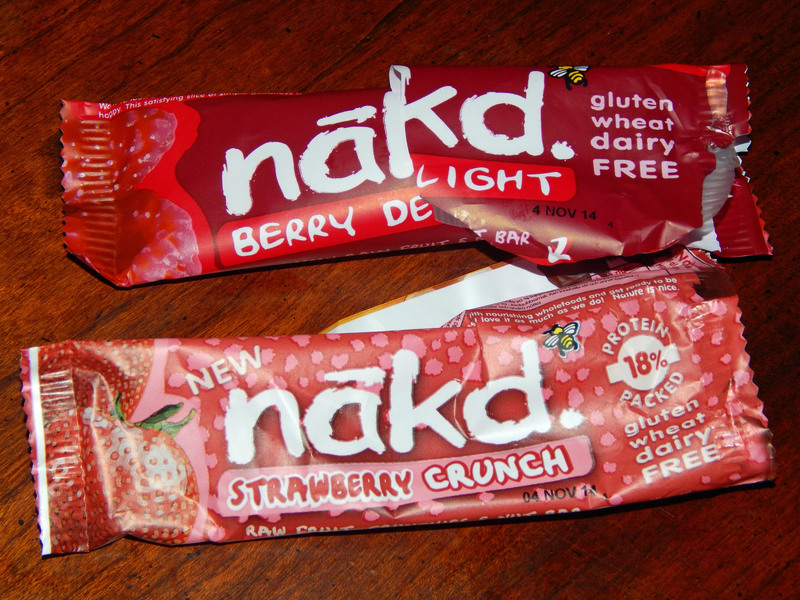 Again – full disclosure – I was provided a free package of 13 Nakd bars in return for an honest review. As always, my opinions are my own and cannot be bought, sold, or tampered with. Thanks for the review! I’ve been looking for a bar that not chocked full of sugar or sugar alcohols and is low in sodium. I might have to give these a try. I think most bars might as well be candy bars! The sugar and salt in some of those are incredible! Great, thorough review. 🙂 Can we have Lara bars in exchange please? What US recommendations would you make as I am going to be in Florida in October? What part of Florida will you be in? Off the top of my head, I can think of two things you should know. One, although it is easy to find vegan food at Heathrow or Gatwick, it is very hard to find vegan food at American airports. Additionally, although we put in vegan meal requests, we have always brought “vegetarian/vegan” on the plane. So once you check in through security at the London airport definitely buy some food to take with you. Also, America is the flip of London. In London there are lots of vegetarians and almost all restaurants had vegetarian options on the menu. However, it was sometimes very hard to find anything vegan! In the US most people who are veg are vegan or working their way towards vegan. So you will have restaurants that offer NOTHING veg on their menu at all. But the ones that do offer vegetarian choices almost always have vegan choices as well. Thank you for all of your advice!! I am going to Indian Shores. I went last year and didn’t do too badly, it was just a little bit more explanation needed but everyone was very accommodating! I always take LOADS of snacks with me on trips. I have learnt that along the way. This is exactly what I call for! No added sugar or junk, AND delicious AND portable for camping trips? Sign me up. Oh, they are so good. And yes they are portable. I threw some in my purse and they didn’t break up, disintegrate, or melt in this Southern heat. Any idea if and when they will be available in stores here? I like the chocolate Nakd bars the best, especially the cocoa orange and the caffe mocha! I love those bars too! I live in belgium! We can buy them in specialized organic shops! They are expensive though! !